SEO for restaurants can be achievable with a handful of simple optimizations. This guide should help you achieve better results in organic search marketing by having a clear focus from start to finish. In this post, I will break down some restaurant SEO tips and what you can do to drive more search engine traffic to your site today! I offer a SEO Coaching to discuss next steps with your site along with SEO Expert Services on an ongoing basis if you have an interest. Scanning your menu and posting it on your site is not a good SEO practice. The reason why you want to stay away from scanning your menu is that you lose out on all SEO potential. SEO keyword research for restaurants can be achievable by optimizing the menu too, so I want to show you what you can achieve with a little work. Let’s says I am in Boston Massachusetts and I have family visiting from different states one weekend. 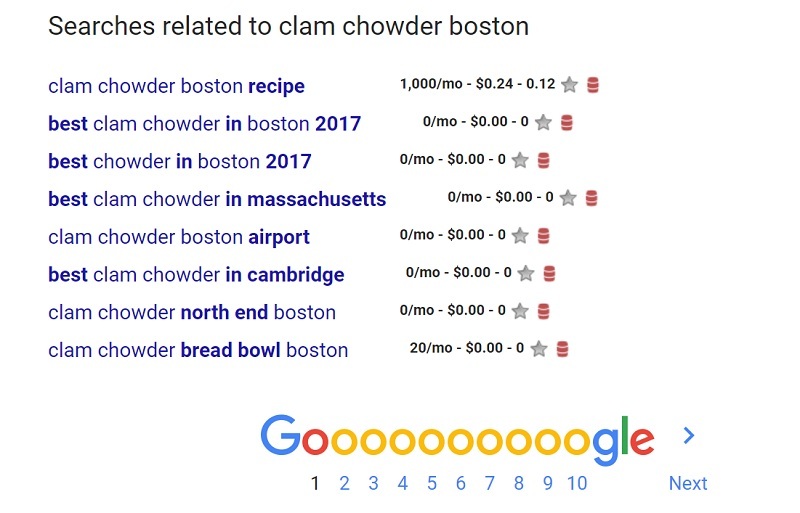 Everyone wants to have clam chowder for lunch, so we Google clam chowder near me to see what comes up. Please take a note that over 6 thousand searches for this phrases happen each month, you so have a tremendous opportunity here to drive organic traffic to your site. Let’s says that I click on the Out of the Blue restaurant to check out their menu. The way Google was able to tie my search query to this result has to do with Out of the Blue’s menu. 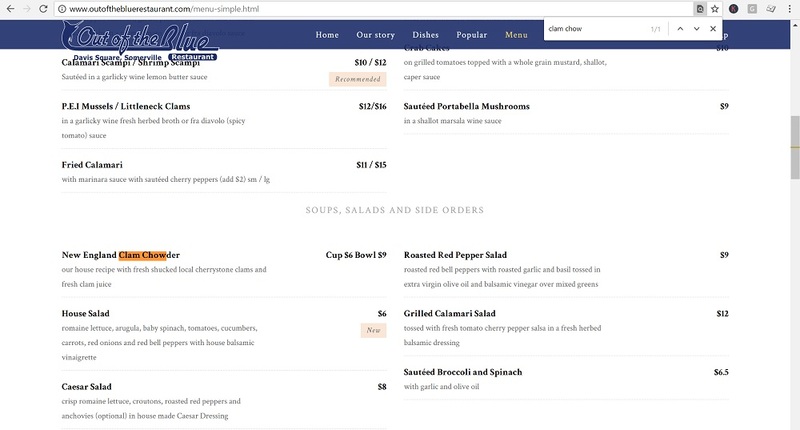 Instead of uploading a PDF of a menu, Out of the Blue wrote out each part of their menu as HTML. 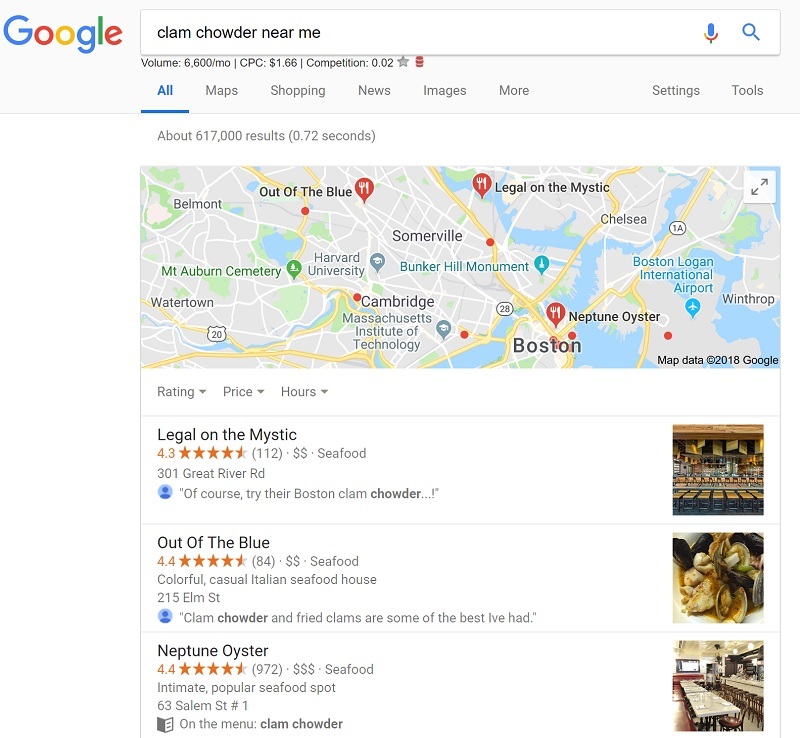 HTML is what Google and Bing use to read and understand a website, so they were able to read that clam chowder was on the menu and present that to my search. This is a very basic way how search engine work, but a PDF of a menu will never rank in Google. 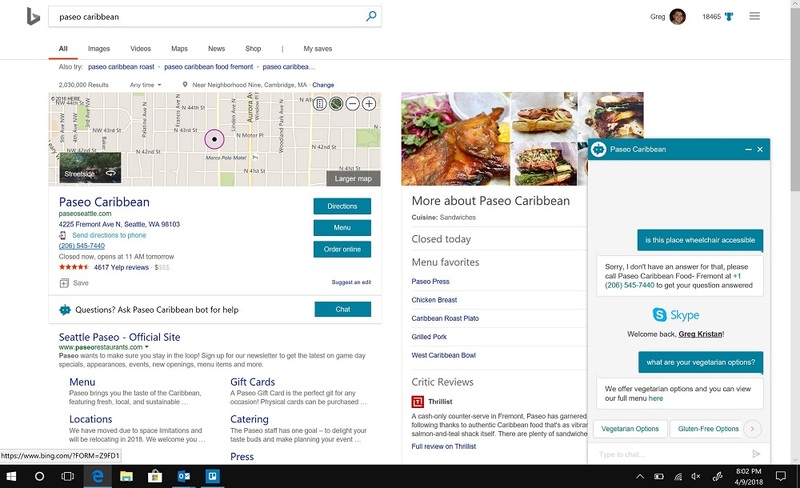 Microsoft Bing offers the ability to build chatbots directly for your business in their results. This type of optimization takes work to achieve, so you need experience with coding. Once you build the framework with answers, people can interact with the bot when they come across your listing. Interacting with a bot can save you and your staff time from taking calls that can be answered with a simple answer to a question. If you would like to explore this option, you can check out the Microsoft Bot Framework section. Before you dismiss Bing, I like to point out that this search engine powers AOL and Yahoo too. For desktop users in the United States, Bing search makes up about 20% of the search market share, so don’t overlook this engine with your organic stategy! Name, address, and phone number are key ranking factors for successful local optimization. Moz Local is a free tool that shows all of your business listings on the web. Moz Local will showcase every listing you are missing or incorrect too. Online listings include places like Facebook, Yelp, Yellow Pages, and more. By filling out your business information on these places, you increase your chances of driving referral traffic back to your domain while giving more signals for Google to rank your website in their results. Google my Business Listings and Bing Places for Business are critical to have if you want your photography website to show up in their results. Google and Bing showcase a map results directly into their results when a local search happens. Both search engines use the data that you provide in your business listings to showcase results to searchers. A favorite way to optimize your local restaurant is with schema markup. Schema markup is code on your website that Google and Bing look for to understand something with more clarity. I like to explain to clients that schema is the highlights that a student makes in their textbook for their note taking. For search engines to quickly glance at a webpage, they can look for highlights to see what are the most critical parts of this content. 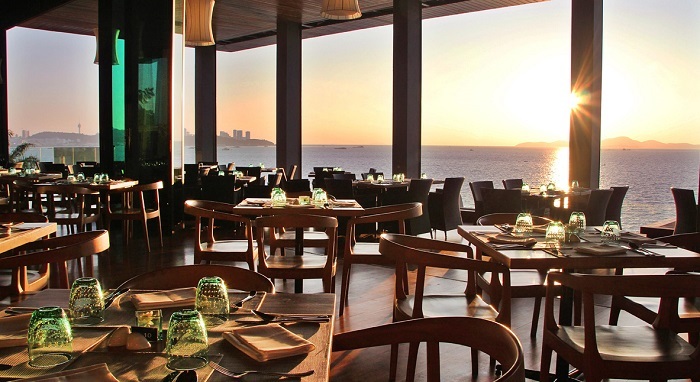 You can check out this link that breaks down the elements of restaurant schema. High-quality photos of your restaurant and food can help make the decision that much easier for a potential customer. For SEO, you want to use a descriptive ALT tag to help organically rank your pictures in Google and Bing. The file size of your photographs should be compressed where the quality is still apparent. Google Maps, in particular, uses crowdsourcing at times to better categorize food restaurants and what they can accommodate. I have been out to restaurants during lunch and will later get a question from Google asking if the place is wheelchair friendly. If your location is wheelchair friendly, you should call this out. If your business has a location near public transportation, you should make a note around that. Google wants to tie accessibility into their results, so give that information if it pertains to your business. Getting your restaurant featured on third-party results is a great way to build brand exposure, brand dominance, and brand identity. Let’s say you opened up your business in 2018. 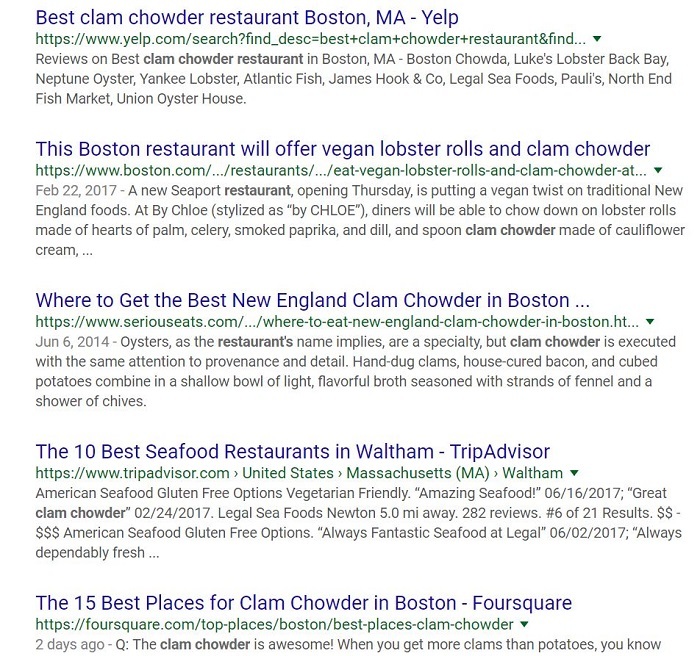 You take a look at Google and see the second listing is from 2014 when you search for best clam chowder in Boston. You can contact that site’s owner to ask if they can include your restaurant in the list since the article came out before your business was launched. This is an effective strategy because it’s a relevant link for your business that will appear as the second listing in Google for that search term. Let’s take that example of clam chowder from above. As a business owner, you want to research the best keywords for your restaurant to be found online with. Below are free tools that I use to show how many more topics you can cover on your website for keyword research. Answer the Public is a website where you can see questions people ask for any topic. If you have a blog on your site, you could cover many of these topics as their own blog post. You can take your blog with a different angle and cover healthy diet options that people search for that relate to your menu. If you want your business to appear on Google, you should study Google’s results. By using the Keywords are Everywhere plugin with Chrome, you can get an idea of the monthly search volume that each term yields in Google. As a note, you will see that these results above have no search volume according to Google. A lot of these terms with no search volume fall under the bucket of long tail search, so Google and or this tool have not been updated to show their average search volume. Registering your website with Google Search Console and Bing Webmaster Tools is a significant first step in SEO. The tools will give you a plethora of insight into how both engines see your website. Both services will show organic terms your site ranks for, so definitely check that out. This guide was more of a compass of best practices to follow for a restaurant trying to win in SEO. Many elements that I did not go over include speed optimization, clear architecture, image size, competitor research, and more. There is more to search engine optimization than those elements, but this should be a good starting place for you to get ahead. If you are looking for help to grow your business, I offer a SEO audit that can help find specific opportunities to help improve your online presence.